For generations since the first batch of Sikh migrants arrived into Malaya before the 2nd World War, we’ve pride ourselves in how well we’ve adapted culturally while maintaining our distinct personality and character. The local Muslim Malays here have embraced us over the decades as steadfast people, proud of their heritage, just and fair, aggressive in nature be it physical or emotional. Of course, like any other culture, there will be nuances and tweaks to it stemming from the local environment and influences from our neighbours over a long period of adjustment. 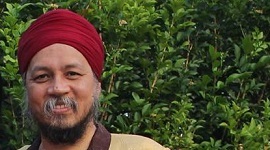 That’s just natural, but over and all, Sikhs in Malaysia are distinct enough to garner recognition at all levels of the melting pot that is our Malaysian society. Muslims can identify with our reverence to our Holy Guide that is the Guru Granth Sahib, it being in a form of a book very much like their Al Quran, compared to their other neighbours of Hindu and Buddhist descendants. Like any other culture, we’ve also got our taboos that can take hold of our judgment and make us maintain certain biasness within our very own fabric of society. It is indeed unfortunate that these taboos passed down to us from our elders, as we were molding our beliefs from a very young age, weren’t fully justified nor explained to great lengths as to why they were formed to be taboos in the first place. Rather we accepted them as wisdom that had never failed our elders in their times, good or bad. One such taboo, which was always discussed in hush manners, was of inter-faith marriages, especially marriages with our Muslim friends and neighbours. Horror stories of forced conversions, body snatching from morgues to appease Muslim burial rites, fierce destructive divorce cases and broken families were fed down, with hopes of instilling fear onto the younger generation into not making ‘the mistake’. From my limited understandings of these fears, it was very clear in my mind, when the time was ripe for me to start a family that marrying a Muslim girl would be of great detriment to my relationships with my parents and extended family. In short, this very taboo took the driving seat for us when it came to making life impacting decisions. It was a typical family dinner, as I nonchalantly remarked to my dear wife at the dinner table about a WhatsApp rumour going around regarding a recently converted Muslim boy of Sikh lineage. The details of this rumour isn’t wholly relevant to my thoughts here but suffice to say, the topic of the rumour piqued great interests from my two daughters. They immediately picked up on the gist of our very short conversation as our biased disapproving tone in voice and body language gave away too much. The same disapproving tone derived from the fear factor that we were entrusted upon from our elders I mentioned above. The very same raised eyebrows were evident. The reflex reaction from both me and my wife was to repeat and rinse what was told to us by our parents and wise elders before, which remarkably was universal even though our backgrounds differ quite a bit. I’m half Chinese from a relatively small family compared to my wife, a thorough bred Punjabi from a family of six. “Just don’t do it and don’t ask us why again,” was the answer given in a plea like manner. We tried to explain to them that the lifestyle choices to be made after marrying a Muslim would be very much different from what we’ve tried to teach them in life so far. It got a little bit tricky as we now had to explain the mechanics of religious conversion, which was the biggest factor to these altering life decisions to be made. But their inquisitive minds, and strong willed argumentative nature of which we’ve tried hard to instill since young, got the better of us. They had good grounds to ask this question as they were now preparing for a wedding soon of which their uncle will be marrying a Caucasian lady from US. This new auntie of theirs has gladly chosen Sikh practices albeit not entirely. Not to mention they had just lost their dear grandmother of Chinese descend who had adopted much of the Sikh way of life and abandoned her earlier beliefs altogether. Consciously, my wife and I have been trying very hard to embed some core principles integral to the fundamentals of Sikhi for our children to hold steadfastly to. One of these principles were for them to recognise that each human being that they meet and grow with would have uniqueness that cannot be judged upon, rather this uniqueness was to be embraced and celebrated for its very nature. For example, meeting another person of another faith and race shouldn’t matter much in their acceptance of this person. Action speaks louder than words, and we’ve not been successfully practicing what we had preached to them, especially in this conversation at the dinner table. We were bereft of ideas for maneuvering through this tricky conversation while trying to avoid being contradictory on the lessons we had tried to impart before. We retired the discussion when the clatter of utensils on our plates got louder while promising them we would continue this discussion and satisfy their needs to understand at a later day in the week. We apologised meekly and told them we weren’t prepared with adequate ‘homework’. This jargon they understood, being in Primary School, and they shrugged the unfinished dialogue off as they had pressing matters to attend – the dishes and cleaning up of the kitchen. As I write this, I’m framing my points of discourse, very careful as to not sweep it under the rug, (metaphorically speaking, of course) for my approach with my daughters. First, we would try to explain to them that finding a partner suitable for marriage would be their own duty. Whatever decision that they make, they take the consequences upon themselves, while we will still be present with open arms and love them as much as when they were entrusted to us. Our job is to equip them with the tools, skills and knowledge for them to be able to ascertain their best options that would be laid in front of them when the question arises. This includes further increasing their exposure to the beauties of our way of life as Sikhs. This cannot be the rules, the dogma, and the double standards of our own interpretation of what we hear and do not reflect upon. We would rather share with them the spirituality of the way of life rather than the more structured religious aspects of it. Mind you, sharing the beauties of Sikhism doesn’t translate to sharing our own perceived ugliness of others unlike us. In a nutshell, we should not demonise others and their beliefs, rather we elevate the beauty and majesty of ourselves, our heritage and our history. This cannot be done as an island of ourselves, we would need to rely on the Sanggat of the same passion and understanding. Would it be so bad if they eventually did marry a Muslim and convert? I’m not so sure now because if they continue to uphold their principles that make them God loving humans that do not practice prejudice and harm, perhaps that is their path as willed by God herself, another principle that we would need to teach them soon. With suspected high rate of divorces in almost all religions, getting married within the same community or religion may not ensure that the marriage will endure. To my question to some in PJGS yesterday whether divorce or polygamy is permitted in Sikhism the replie was ‘NO’ for both questions. The next question posed was that why do some Granthies solemnize marriage where one party may be a divorced and the reply was that Granthies as employees follow directions of GMgtC. Can M G Council or other experts provide some guidance. Further what about where both parties separate by mutual consent as happened in my own case earlier over fifty years ago when civil marriage was not mandatory? This does not apply to those who are widowed as I was. Hope this will not start another controversy and readers will provide useful comments without any insults or uncalled for remarks. Question: why some people have bad faith in their religion? Why go marry outside. R u a loser or r u going after material world. Can u get any peace by doing that. If u cannot find as you r now can u find it elsewhere!! Born a Sikh die a Sikh. Lack of knowledge in sikhi religion n customs leads to strayed life. Tq Jagdesh Singh for writing on this subject. Kuldip Singh s/o Durbara, PJ. Shah Rukh Khan is a Muslim. Apologies for error. If we keep saying things like.. ‘ why should I bother..’, ‘ I have my own house to clean..’, ‘ it’s none of my business..’, ‘ well, it’s their choice..’, ‘we can’t be judgemental..’ etc, etc, ….well then, whose problem is this? To which particular race/ religion are the fingers of others being pointed at? Can we run away from the reality that as a community or society, we do have an identity of our own? Can we now deny that we are punjabis or Sikhs? Or are we pretending to be open minded when in real sense, there are norms to follow being part of a particular society? The issue here is not about cherishing God as one and for all but … is about one particular faith that forces another to embrace theirs in the name of love/marriage. Now, let’s reflect on my first paragraph that imposed lots of questions. If we being part of a society that practices at least the same faith and culture if not beliefs, then how can we at the end of the day conclude by saying that it’s not our problem? Is it just because the ppl are not our family members? Or that we are not bearing the shame that resulted? Is being concern about the welfare of one’s own society means that we are busybodies? Is washing of hands the solution? If we don’t take charge, then who will? I, personally feel that we should take serious interest on what’s happening in our own society and that it is a pity and shame if we don’t. We certainly not going to let the society of others judge us….or do we? personally I feel that God is one and its the mentality of our society. I find our society be it any background always have this question: “what will people think?” we are so egoistic about what will people think.To some extend, that is their views when it comes to their children wanting to marry a different race. seriously, just for a second stop and think – if the person they want to marry accepts them as how they are and your children are going to be happy then whats wrong? speaking from experience and a bad one – marrying a sikh does not guarantee you a bed of roses. with them their ego comes along and i personally dislike it. i have seen n met many beautiful souls some are sikhs and some non sikhs.i love my religion, i see it differently though like for me end of the day God is one and marrying a good human is utmost important besides branding the person by their religion/faith. All religions teach the same it is the humans who created their beliefs and at times misguiding the community. End of the day, we can plan to no end but everything has already been written by the Big Man up there. these thoughts are just my two cents just as how others have put up their opinions too. from where we all stand, we always have our personal reasons n justifications which is not wrong; we just have to be less judgemental me inclusive. One should look at history and realise what the Sikhs endured during Mogul rule and how they fought to keep the religion alive today. Our Gurus and Martyrs are the very reason the beautiful Sikh religion continues to breathe today. Guru Nanak preached equality in the human race regardless of faith. We talk expansively about Sikh issues in a modern social context – in failing to consider history, our reasoning in these debates lack true substance. Future generations ought to be taught about Sikh history so that they understand where their religion originated and the amazing journeys the Gurus pursued in forming the Sikh religion. Being able to link history to modern issues will help them to provide a much more educated contribution to such discussions. Life is inevitably riddled with uncalled for stress, unhappiness and other serious challenges, no matter who (or whether) you marry. Ask any Sikh person who marries another Sikh person whether they live a life free from uncalled for stress, unhappiness and other serious challenges and their answer will be an unequivocal ‘no’. I don’t think I’ve seen enough of life to have an opinion on mixed marriages. I’m not sure I even need to have an opinion! I will say this: in the Malaysian context we all know why there are strong views on this subject. For me it seems hypocritical for a person to make a choice/ change/ conversion in their life, and by making that choice then deny everybody else the right to making theirs. This is effectively what happens as converting out isn’t really an option. As for other communities, I honestly feel it’s none of my business. I may have my personal preferences, but then others have their own. If it is a choice that has been made and it is harmonious, then I say celebrate the harmony and support the family with compassion. Who am I to judge when I have own house to clean? It can be tricky and difficult to tackle the inquisitive minds of our children on complicated issues such as above. If it is about marriage and marriage alone, then there shouldn’t be any difference between one faith and another. All faiths should be treated alike. As long as both parties are in harmonious relationship without any one of them have to abandon each other’s faith or belief, then it’s beautiful and that should be the way. However, if either one of them are required to let go of his/ her faith, then the relationship has now become selfish. In the case of marrying a muslim, it is like abandoning one faith to embrace another. What sense does that make? If God is said to be one, then why the need of converting? Again, where is the mutual respect here.. mutual understanding and trust between the parties? Sikhism on the other hand, does not advocate ppl to practice discriminatory but love. Yes, our culture and strong roots have always been on the upperhand when come to such issues yet interfaith marriages still take place. When our children ask us this sort of tricky question, then tell them that we dont break old/ existing relationships in order to make a new one. We don’t break away from the existing faith in order to make a new one. It is simply as simple as that. Marriages should unite and not to break. We should feel happy and contented with whichever faith we were born with and as such, the issue of converting should not come up in the first place. In malaysia married to muslim is bad. Why. Bcoz you need to convert compulsary. But in India or Indonesia or Singapore is good. You no need to convert compulsary. Why you to convert when god is one. If you can eat nasi lemak and chapati without convert. Why married to muslim have to convert. Love knows no boundary greater than religion in this country. Are we overreacting where marriage between Muslims and Non-Muslims is concerned? I don’t think so. Muslims are not the only community that make conversion a prerequisite to marriage to someone originally of a different faith. However, marrying a Muslim in Malaysia brings a whole onslaught of legal issues should the marriage dissolve and the converted party seek to return to their original faith. If conversion were not a matter of legal import, marrying a Muslim would be no different to marrying a Christian, a Buddhist, etc. . The real question is, should we instead be working towards discouraging the practice of converting one party to the other’s faith in an interfaith marriage? After all, the parties actually involved decided to be together regardless of religious differences. On the surface, inter-faith and inter-race marriages may look feasible but in reality there are immense challenges in making personal sacrifices and compromises on both sides. Obviously, there is no denying that there are many cases of very happy and successful inter-race marriages. It is imperative that before any one embarks or steps into an inter-faith marriage, both sides must very carefully look at each and every challenge. Personally, for me the major consideration is when it comes to practising of one’s religion. Some religions are very strict on the compulsion for conversion. This conversion is basically irreversible. In other words, should a divorce take place, renunciation of the adopted faith is also impossible. I would strongly discourage any children from such marriages. Why invite uncalled for stress, unhappiness and other serious challenges?